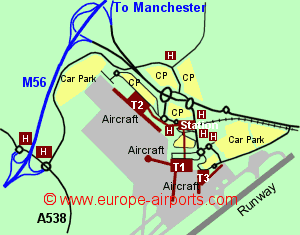 Manchester airport has 3 terminals with 1 and 3 being connected, and terminal 2 at a distance of 700m with a travelator connection to terminal 1. Terminal 3 is used mostly for domestic flights. On 01/04/19, a new pier connected to T2 was opened, the first part of a £1bn transformation. Manchester airport has its own railway station (with covered moving walkways to terminals 1, 2, and 3 via terminal 1) with connections throughout northern England, and there is also a local bus service. National Express bus connections include Leeds, Bradford, Oldham, and Liverpool. The airport also has a connection to the city's Metrolink tram system (opened in 2014) with trams running every 10 minutes through most of the day. Between it's 3 terminals, Manchester airport has 23 bars/cafes/restaurants, 31 shops, currency exchange facilities, FREE WiFi Internet acces (payment required after 60 minutes or for heavier usage), and a conference room for upto 400 people. There are several hotels within the airport perimeter, the 5 star Radisson hotel being connected to the station and terminals 1 and 2 by covered walkways. Manchester airport has Airport Carbon Accreditation, at the Neutrality level. During 2017, Manchester airport catered for 27.8 million passengers, an 8% increase on the previous year, and the busiest year yet. Manchester airport is the 3rd busiest in the UK, and is by far the busiest in northern England.